Good building and delicious food go hand-in-hand. Having a nice atmosphere in which to prepare and eat our meals is important to our school. Our spring workshops are geared towards creating this shared space. Over the course of two week-long workshops, we will construct a community kitchen and dining house, on the south side of our pond, along the wood line. 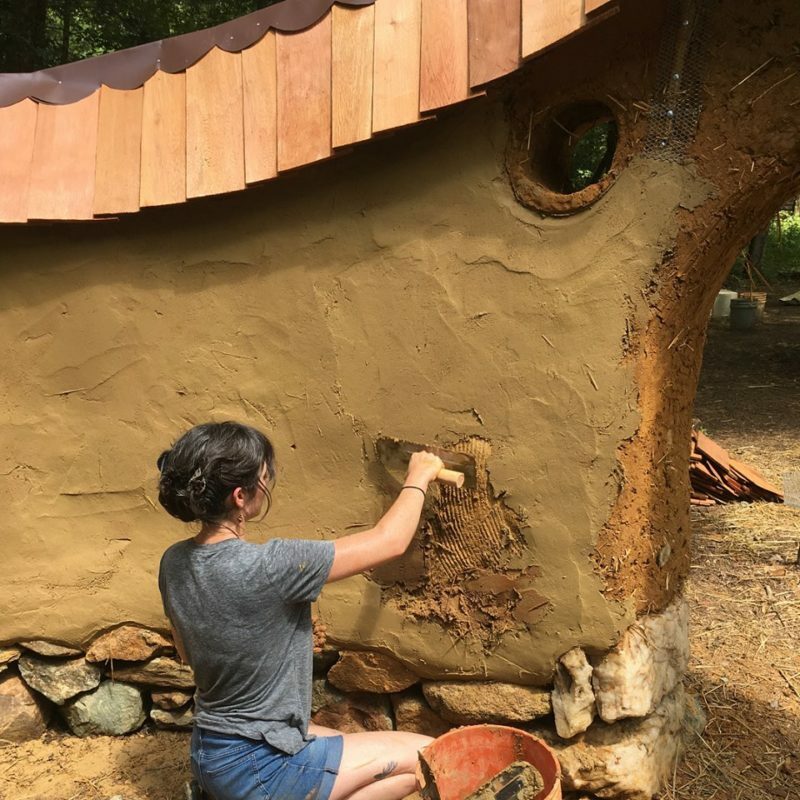 The building process will include a variety of techniques: cob, strawbale, dry-laid stone, roundwood framing, wattle-and-daub, living roof installation, slip-straw, and natural plasters. The focus of one workshop will be cob. The other will emphasize strawbale. In our cob immersion, we will be mixing and applying a very large volume of cob. 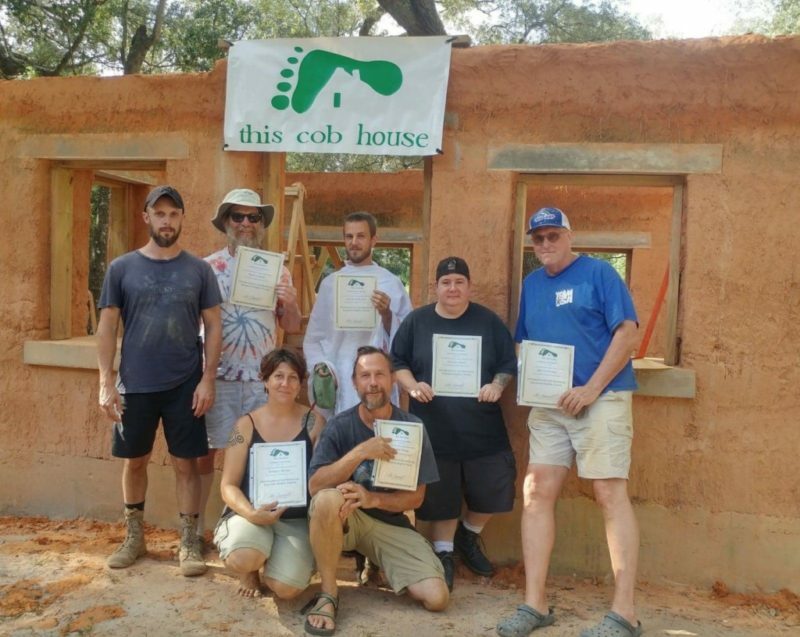 Everyone typically leaves this workshop with the confidence to design and construct their own cob project. The foundation will already be in place. We will complete the walls (including windows, doors, shelves) and install the green roof! 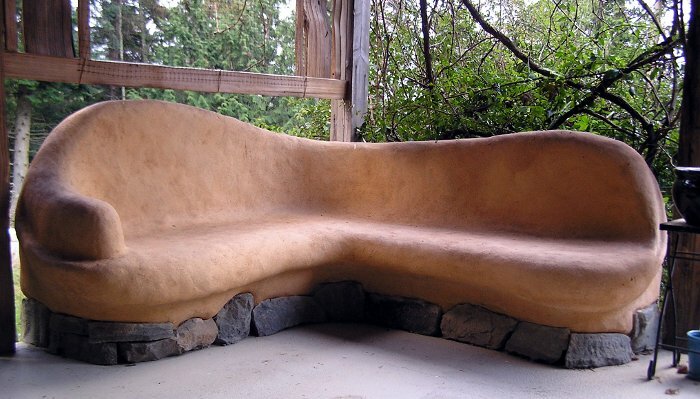 You will learn different mixing techniques, different mix recipes, how to apply cob in all situations (down low, up high, around windows and doors, with sculptural elements, etc…), and how to maintain your in-progress wall so that your finished building is both sturdy and ready for plaster. We will additionally be building with straw bales, as well as wattle-and-daub, and slip-straw. Natural clay plasters will be mixed and applied near the end of the week. We will have sit-down discussions and presentations to cover topics that are not included in our hands-on experience, like design, siting, plumbing/electric, and foundations. Provided as part of the workshop are three wholesome meals each day, camping sites, and facilities. Instruction is in the hands of Greg Allen and Mike McDonough, both graduates of the Cob Cottage Company’s 2008 Apprenticeship program. 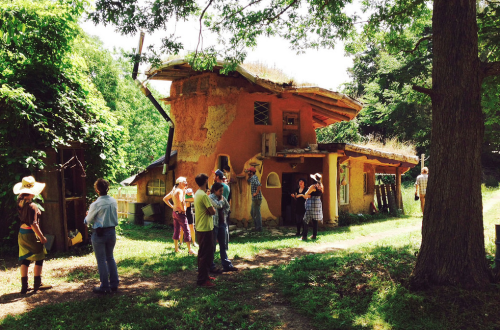 Join us for another spring of complete natural building workshops!